Now is your chance to travel to the farthest reaches of the earth and discover the treasures of King Tut's Tomb. Click here to play! You'll find yourself excavating the forbidden chambers of the boy king's pyramid to find ancient relics, jewels and golden idols that will pay out handsomely. 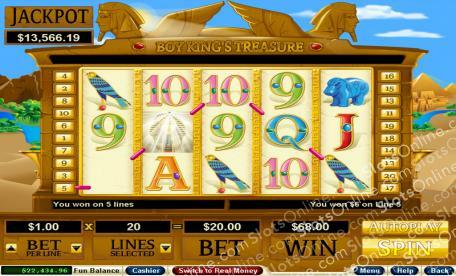 You're in search of ancient treasure and King Tut's golden bust is going to help you multiply your winnings. Collect five jeweled bracelets and win 1800 times your original line wager; however, if Tut's golden bust appears you'll win up to 3600 times your wager. The same applies for the golden wild cat, which pays out 1000 times your wager, 2000 with Tut's help. Various other symbols will help you cash in on the Nile such as the jade hippo and falcon that can pay out up to 750 times your wager. Cobras are abundant in the hot desert, but don't worry because these golden snakes act as the scatter symbol and will reward you with free games and multipliers should you collect two or more anywhere on your board. Take a trip across the golden sands of Egypt for an adventure that will see you unearthing the Boy King's ancient treasures. Three or more Cobras anywhere on the board will award you with free games and and multiply your winnings depending on how many you get.